This month we have highlighted 28 student organizations that allow students to pursue their passions and make an impact in their community. There are currently over 100 registered student organizations at Mount Holyoke, and hundreds more that have existed over our 179 year history. These groups range from cultural orgs that celebrate our diverse community to sports teams that show the power of being a part of team, from musical ensembles that entertain thousands of people to advocacy groups that work to improve our wider community. 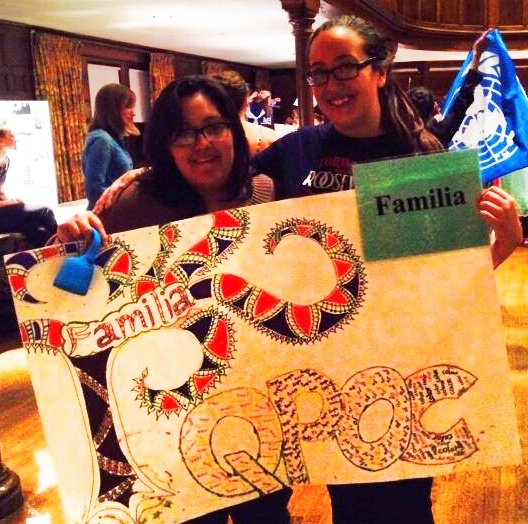 With so many wonderful student organizations at Mount Holyoke, we were only able to cover the tip of the iceberg. Did we highlight your favorite group? Ever since Mary Lyon founded Mount Holyoke in 1837, it has attracted a community of dynamic leaders looking to use their passion to make a positive impact on the world, from the first generations of missionaries and teachers to our current students. 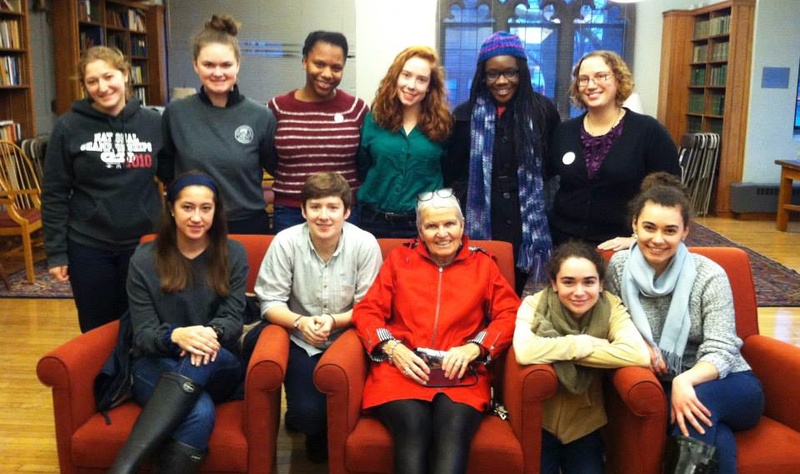 The Student Philanthropy Committee (SPC) was formed to allow students to come together to discuss ideas of philanthropy and its impact, as well as the significant role of philanthropy in Mount Holyoke's history and future. In honor of Mary Lyon's 219th birthday, here is a special post by the chair of the SPC celebrating Mary Lyon and the tradition of philanthropy that she inspired. Philanthropy (noun) is defined as “the desire to promote the welfare of others, expressed especially by the generous donation of money to good causes,” but I think for Mount Holyoke, the etymological definition of “the love of humanity, in the sense of caring, nourishing, developing, and enhancing what it means to be human” is a better fit. Founded in 1837 by Mary Lyon as an institution of higher education for women, Mount Holyoke College could not have opened its doors without a wide base of financial support from both prominent men who backed her revolutionary ideas and the local women’s sewing circles that donated the quilts and bedding. After leaving her job as assistant principal of the Ipswich Female Seminary, Mary Lyon traveled thousands of miles with her green velvet bag to raise funds and support, driven by her dream of opening an institution of higher education for women. After three years of her tireless efforts, the Mount Holyoke Female Seminary opened its doors, offering both a rigorous curriculum equivalent to those at men’s colleges and a low tuition to make education affordable for students from modest backgrounds. To this day, her philanthropic efforts and beliefs still reflect in the Mount Holyoke mission of educating talented students from all backgrounds through an intensive liberal education, preparing them for thoughtful and purposeful engagement in the world. 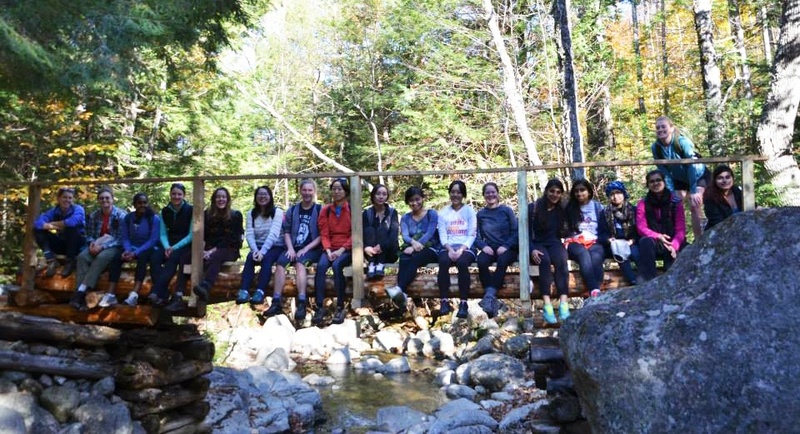 The Outing Club seeks to cultivate and enrich Mount Holyoke students' appreciation for nature by providing accessible trips, leadership training, and community outreach in the outdoors. The organization believes in being all inclusive and respecting the differences of all members by striving to create an environment in which everyone feels capable and comfortable. As a club, they also strongly believe in the importance of cultivating leadership and hope to do so through sound training and having fun in the outdoors. Mount Holyoke scholar-athletes are driven to excel in the sports arena as well as the classroom and laboratory. The discipline, sense of accomplishment, and competitive edge fostered in sports resonate through every channel of their intellectual lives. 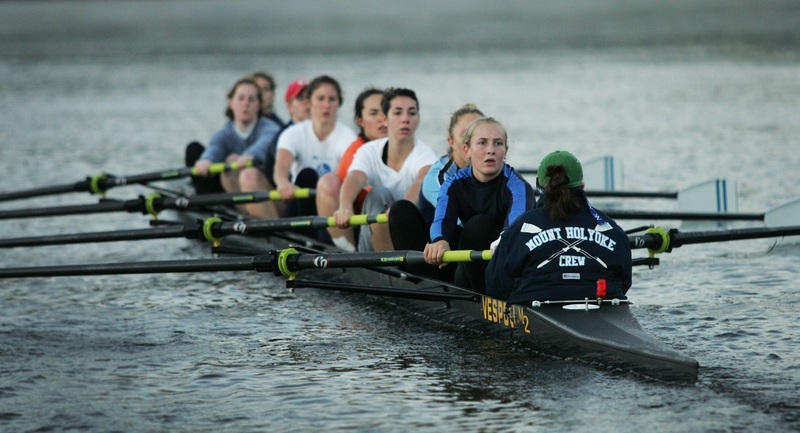 Balancing scholastic, athletic, and extracurricular activities, Mount Holyoke Crew Team members are champions of numerous endeavors. Among their alumnae are Olympic medalists, World Championship competitors, and Rhodes and Fulbright Scholars. The Mount Holyoke Rowing Team was founded in 1875, concurrently with a club by the same name at Wellesley College, on the grounds that the sport “promoted the grace and form of the female body.” Competition was strictly forbidden, as it was thought that over-exercise would ruin the oarswomen’s physical appearances and make them unhealthily muscular. Mount Holyoke’s own Harriet “Holly” Metcalf ’81 won a combined five World Championship and Olympic medals in her career. A six-time member of the U.S. National Team, she captured the Gold Medal in the women’s eight at the 1984 Los Angeles Olympic games. Metcalf started her coaching career as the head coach of the varsity crew team at Mount Holyoke from 1981-1985. Metcalf went on to direct the Silver Medal winning crew at the 1990 World Championships. In the 1990s, she earned a master’s degree at Harvard, studying rowing as a metaphor for girls’ and women’s psychological and emotional development. That experience prompted her to start Row as One programs that have initiated women into the demanding sport and inspired advanced rowers to be more competitive. She extended this concept to inner-city girls in 1996 with her G-ROW program in Watertown, Massachusetts. A recent Pre-Law Association "Internship Info Session" event in collaboration with the Career Development Center. Guest speakers included Pre-Law Advisor Roshonda DeGraffenreid FP’10 who spoke about Lynk funding, and also association members who spoke about their past internship experiences. Art law, civil rights law, environmental law, international law...the legal field spans a broad range of industries and expertise, enabling people to pursue their passions and make an impact. But where can an MHC student go to learn more? Thankfully, the Mount Holyoke College Pre-Law Association is there as a resource and network. Comprised of students considering pursuing law school or a legal profession, the association aims to increase awareness about this vast field and to create a peer community where students can gain inspiration and foster their passion for law. Through collaboration with the Career Development Center (CDC), the association helps guide students through the law school application process, preparing for the Law School Admission Test, and choosing suitable schools. The association also works at educating members on various fields of law and career exploration. Student Art Board & WMHC, Grist~Kisser~Neoteric Fall 2014. Founded in the early 1990s, Mount Holyoke’s Student Art Board aims to make art more visible on campus by curating exhibitions displaying work by fellow students and members of the Five College area. 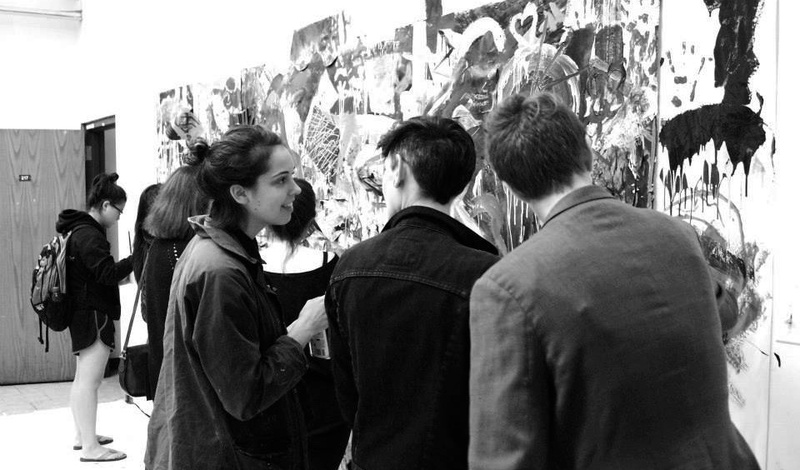 They also act as a liaison between students and the Department of Art at the school, providing space for expression and interaction with art and other artists outside the classroom. Their gallery space, located on the second floor of Blanchard Campus Center, is reserved for curated art shows showcasing the talents of student creators. This rotating display of artwork challenges busy students to take a moment to stop in and appreciate the creations of their peers on their way from class to class. 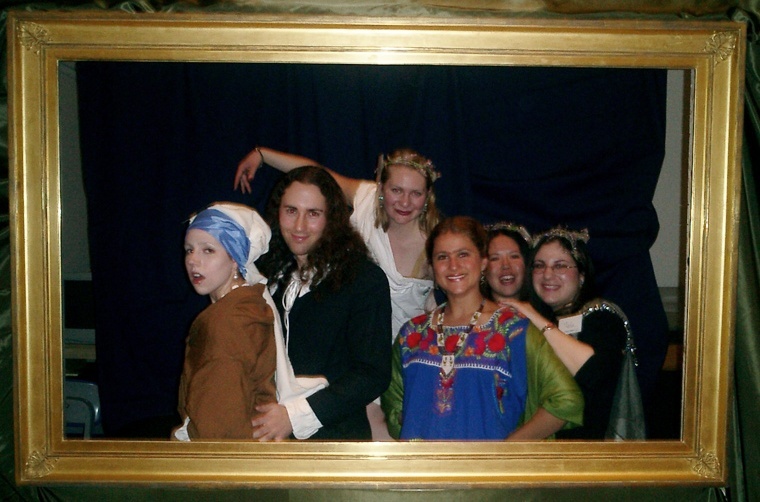 The group also hosts show receptions and organizes trips to local art museums and events. 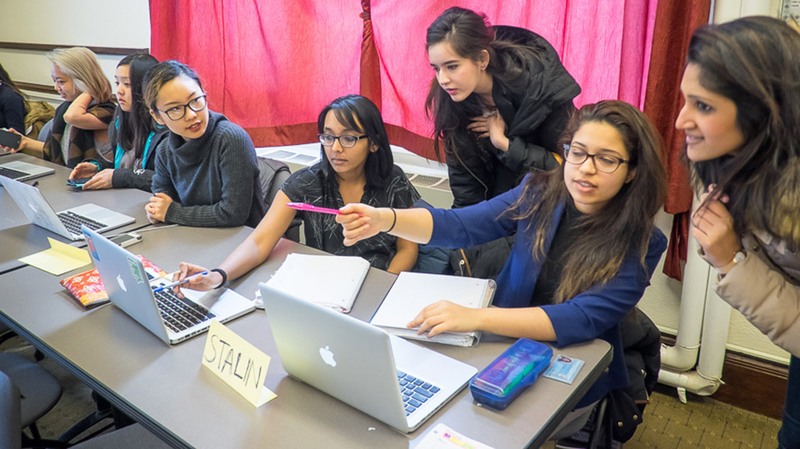 Students practice for a Model UN competition. Photo: Jim Gipe. The Mount Holyoke College Model United Nations (MHCMUN) is a wholly student run organization comprised of a committed and dedicated membership. The interest on international debate may have first arose on campus in the 1930s when Mount Holyoke had a League of Nations simulation club. MHCMUN itself has been around since the 1970s and has been a powerful contender in the Model UN circuit since its creation. Currently Mount Holyoke has been placed in the top 50 Model UN teams in the nation. In the 2015 season, the team was ranked third among liberal arts colleges and was the number-one women’s college in the United States. Merita Salihu ’15, a MHCMUN alumna, is no stranger to living life with an international focus. During her time at Mount Holyoke, Salihu interned with UNICEF’s child protection sector, with the Foreign and Security Policy sector of the German Marshall Fund of the United States, and in the Department for European Integration and Policy Coordination for the Republic of Kosova. She was named a Clinton Global University Fellow, a title awarded to those tapped as the next generation of international leaders on college campuses. She was also named a Ruth C. Lawson Fellow in International Politics through Mount Holyoke, granting her an academic award to pursue advanced study in international affairs. After graduation, Salihu began an Associateship in the energy sector at the Ministry of Economic Development, Government of the Republic of Kosova. She currently attends Tufts University’s Fletcher School of Law and Diplomacy, furthering the international and political interests she nurtured while a student at Mount Holyoke and a member of the MHCMUN. 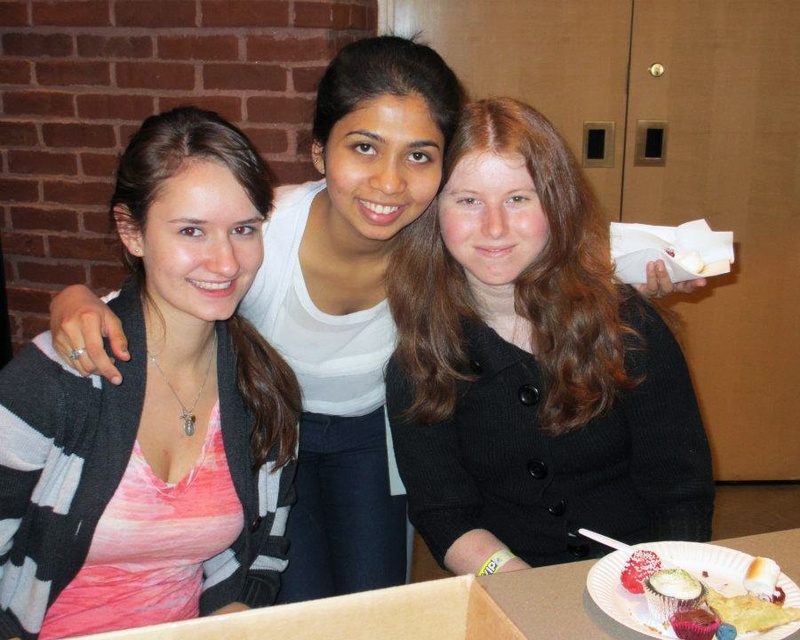 Members of the Women in Business student org at one of their annual events, the Bake-Off Competition. Women in Business is a student-run organization that celebrates women’s leadership and prepares its members to actively participate in today’s business world with confidence. The club serves as a platform for students to develop their business skills and encourages them to take initiative as leaders. 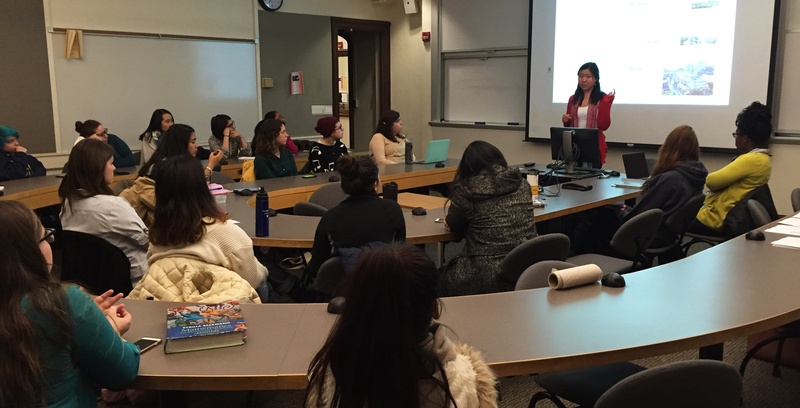 Through activities, workshops, and a new series of talks with alumnae, and other supporters of Mount Holyoke, Women in Business aims to educate women about the diverse range of opportunities in various industries. In addition, members have the chance to attend business conferences where they can be inspired by others’ experiences and participate in networking events. A confidential support network that serves self-identified LGBTQ people of color in the Five College community, FAMILIA aims to increase the visibility of LGBTQ students of color and to heighten awareness by creating a space for open dialogue. Queer people of color have long been involved with LGBTQ organizing at the College. Available records note that queer women of color were actively involved in the historic Lesbian Bisexual Alliance, and edited papers like La Libertad. The forerunner to Familia was SYSTA, which was created in 1994 to combat racism and discrimination among other LGBTQ orgs on campus. Sean King ’14 is one of the many altruistic and community-driven graduates that have left FAMILIA and Mount Holyoke to spread what they’ve learned to others. An African American Studies major and former chair of the FAMILIA board, Sean worked as a legal intern with Faces NY during his time at Mount Holyoke, advocating for community projects serving incarcerated women and planning HIV awareness campaigns. His drive to create and promote positive community experiences continued after graduation and he now works as a Public Ally Fellow, serving middle school students, and as a population management specialist with Care for the Homeless in the greater New York City area. With skills in community-building and the support garnered from organizations like FAMILIA, Sean has moved into the world as an agent of change, growth, and learning. The writers of Verbosity strive to bring the best creative expressions of the student body into the limelight, where they can be admired by the entire community. This Mount Holyoke literary magazine lays claim to being the only campus literary publication that believes in women's literature and art for its own sake; the group welcomes submissions from students from all political, ethnic, and gender backgrounds. Mount Holyoke has long had a tradition of literary greatness—starting with the publication of the Blackstick Review in 1909. In 1999, Mount Holyoke College awarded Virginia Hamilton Adair ’33 an honorary doctorate degree. Adair was a member of the editorial board of Mount Holyoke’s literary magazine and a writer for the Blackstick Review during her time as a student. Adair graduated Phi Beta Kappa from the College in 1933 having twice won the Irene Glasscock Competition for exemplary original poetry. A family tale states that Adair uttered her first poem aloud to her parents at the age of 2 and began writing them down at 6, but after graduation her long-running writing career was put on halt to raise her family and also in part, due to exhaustion from the infighting of the publishing community. As she got older, she began to notice pain in her eyes and a failing ability to see. Her return to publishing came in the 1990s, after her husband’s death, her retirement, and the loss of her sight due to glaucoma gave her the time and freedom to write again. She was published in The New Yorker in 1995, and subsequently published Ants on the Melon, her first book of poetry, at 83 years old.